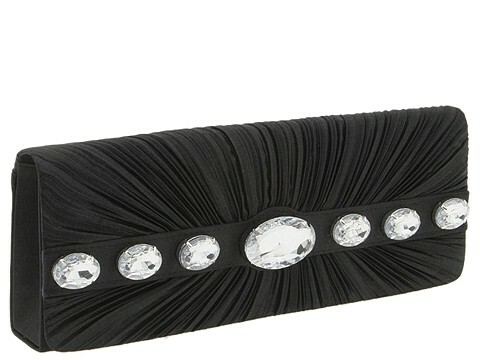 Make a subtle yet glamorous statement with Jessica McClintock's 'East/West 7 Stone' clutch! ; Made of luxurious satin. 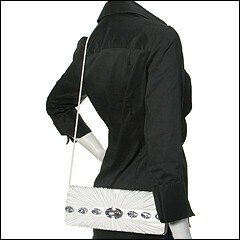 Holds your credit cards, currency, lipstick and a slim cell phone. Dimensions: 11 wide x 1 1/2 deep x 4 1/2 high. 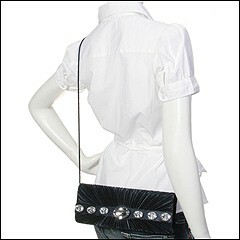 ; Single cross body strap. Cross body drop: 20 1/2 length. Jeweled accents. Top flap with a snap closure. Interior lining with a back wall slip pocket. hint: this is great for the bride, too!